Audra Martinez has always been interested in helping people, which is why she became a massage therapist. 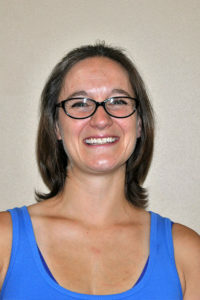 Audra graduated from the Denver School of Massage Therapy in May of 2006. For her clinical internship, she performed five therapeutic massages in a 5.5 hour shift that gave her over 130 hours of experience before graduating. Audra was an employee at a spa and clinic for over 4.5 years where she earned the title “Lead Therapist.” She then ventured out starting her company, Your Massage Kneads, LLC in 2011. Audra then graduated from LMT Success Group in 2014 earning her current title as a Certified Medical Massage Practitioner. Audra originally wanted to help geriatrics. It wasn’t until working at the spa and clinic she found her passion for injury. Since then she has been helping all ages with post-injury, post-surgical and preventative maintenance. In Audra’s spare time she enjoys spending time with her husband and their three boys. They run “family 5k’s” and love doing just about anything outdoors from walking the dogs to riding bikes around state parks and an occasional obstacle course covered in mud.